As you know, I like to grow different plants in my garden every year and one of this years varieties is Spilanthes Toothache plant (Acmella oleracea or Spilanthes acmella ) This plant has earned its name from the mouth numbing sensation caused by chewing on the plants flowers. It can literally stop a toothache. Toothache plant is a tender perennial that only gets to be about a foot tall, but sprawls about twice that in length. The leaves can be eaten in small amounts in salads and they lose their strong taste once cooked. The petal-less flowers are the interesting part though. Toothache plant is antiviral, antibiotic and antifungal has a numbing sensation when used in the mouth or on small wounds like bug bites. When you chew one of the yellow and red flowers at first it tastes like you are eating grass. This is quickly replaced by a numbing sensation. I have to admit the first time I tried it I was surprised by how strong this numbing sensation was. I definitely did not expect it to be so powerful! Toothache plant is a sialagogue. Which means that the next thing that happens when you chew the flower of a toothache plant is that you being to salivate. Not just 'mouth watering', I'm talking full on drooling! You also might feel a cool sensation in your throat. These effects last for about 15 minutes. 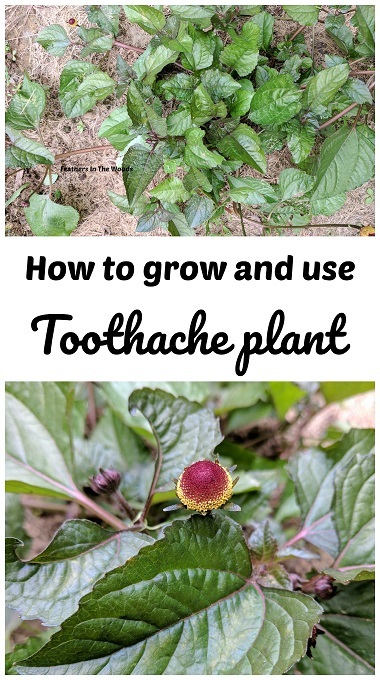 Chewing a toothache plant flower actually does help the pain when you have a toothache, but I find it much more helpful for gum irritations or mouth ulcers. Start seeds indoors 4-6 weeks before last frost date. A heat mat helps as the seeds prefer it to be at least 70° to germinate. Seeds need sunlight to germinate so do not cover with soil until after they sprout. Transplant outside in compost rich soil in a well drained area when all danger of frost has passed. Toothache plant likes grows best in full sun but can tolerate some shade. Plants can sprawl out up to 2 feet, so space accordingly. Toothache plant can be grown in containers with good drainage. Choose a pot that's about 12" across. I water toothache plants every few days, more in drought conditions. I haven't had very much insect damage on my toothache plants. There are some bites here and there, but it seems like pests don't stick around to eat for very long. Slugs are said to like toothache plant, but I haven't seen any personally. Both the leaves and flowers are used so when harvesting, cut back the whole plant to about 6". It will grow back and you should be able to harvest again during the season. A tincture can be made of the leaves and flowers of the toothache plant to help with mouth pain. For numbing effect, swish several drops in the mouth for a minute or so then spit out. For localized pain, a drop or two can be applied directly, or applied to a cotton ball and held on the area. Here's a good tutorial on making a tincture from Healing Harvest Homestead. For throat pain you can also gargle with a tincture mixed with water, or with a tea made with a few of the flowers. I used 3 flowers to 8oz of just boiling water. Steep about 10 minutes, strain and cool. Gargle with 1 oz of tea and relief should last around 15 minutes or more. I've read that some people rub the leaves on the gums of teething babies, but I have not tried it personally. I have rubbed a crushed leave on a painful scratch after a Guinea fowl incident the other day and the pain went away for quite awhile after. The toothache plant is said to have antibacterial properties which is why I chose to use it instead of plantain which I usually use. Guinea feet are pretty dirty though, so I wasn't taking any chances. It's healed up just fine. I harvest the flowers and dehydrate them to store for winter use. They can also be processed as a tincture or decoction but I find they keep longer when dried, then I can prepare them as needed. 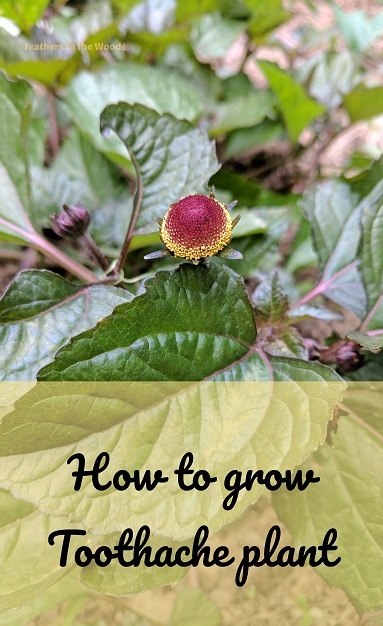 I really like growing Spilanthes Toothache plant for both it's uses and the fact that it just looks really cool growing in my garden! Have you ever tried growing it? Where can you get it ? I've never heard of it before. Sounds like something that should be in every garden. Wonder why it's not more well known? Thanks for the info. I have no idea why it's not more well known. Every year I pick different plants to grow though and I thought this would be a fun one to try! I ordered these seeds online. The company I ordered from is called Rare Seeds, but a bunch of different companies carry them! Look up baker creek seed catalog. Order one for free! Super rare seed collection, I even went to the farm and they are wonderful, knowledgeable people. Tomatoes with the antioxidants of blueberries, rare Chinese fruits..... You will love it. Anything for an herbalists needs or the master gardener. Baker creek, baby! What an amazing plant. I wonder if it is useful for patients who suffer from mouth sores as a result of cancer treatment. God thought of everything when He designed this world. I'm sure it would be helpful in those cases! I bit my lip the other day and crushed up a flower and rubbed it on the bite mark and it really helped! You should try growing some! This is a new one to me! Very interesting. I use plantain for many things, but I'll be on the lookout for the Toothache Plant now as well. And here I am looking it up because it introduced itself to me by way of leaping into a Moringa Tree seedling I bought at the Farmer's Market! He called it Electric Button and said it would numb your whole mouth .... I wonder though ... numbs or burns ? Relieves or distracts? Ohhh, I'm so jealous! It's too cold to grow a Moringa Tree here! The toothache plant flowers actually seem to numb the area of the mouth it's applied to, similar to novocaine. If it gets on your tongue it has a buzzy feel. Hope that helps! I ordered my toothache plant seeds from a company called Bakers creek. Stephanie I am so jealous! I would love to visit their farm. It looks utterly amazing! I've been ordering from them since 2010 and have found so many amazing things to grow! Have you tried the cucamelons yet? That's probably my favorite. I try to grow 2-3 new things from them every year. Such a great company!